By Justin C. I feel like I just reviewed Falls of Rauros' Believe in No Coming Shore a year ago, but I was surprised to see it was way back in October of 2014. I think that speaks to how closely that album has stayed with me, and I have no doubt that their newest, Vigilance Perennial, will hold a similar place in my heart. I feel like I just reviewed Falls of Raruos' Believe in No Coming Shore a year ago, but I was surprised to see it was way back in October of 2014. I think that speaks to how closely that album has stayed with me, and I have no doubt that their newest, Vigilance Perennial, will hold a similar place in my heart. I'm going to write what might sound like a negative: Vigilance Perennial isn't a quantum leap forward from Believe in No Coming Shore. I considered doing a close, almost-academic listen to both albums over and over, looking to catalog the smallest of changes , but that's a good way to kill the joy of music--and probably bore the hell out of you. That said, I'm not disappointed in Vigilance because Falls of Rauros do on this album what they do so damn well. If they make seven more albums just like this one, I'll eat up every one of them. Once again, Falls of Rauros prove that they're the best classic rock/folk/black metal project that never happened in the 70s. For reasons I'd find hard to articulate, I feel like I hear a bit more Allman Brothers in this album than I have in the past, but sounding like Duane Allman and Dicky Betts is far from a bad thing. Of course, they've taken that influence and put Southern rock through their own New England-based lens, blended with all of the other influences they bring to bear. The band starts the album with some truly lovely guitar work, including sweet guitar harmonies, for nearly a minute and a half in the opener "White Granite" before some of my favorite black metal shrieks kick in. I almost wrote "makes you wait through nearly a minute and a half" there, but the guitar work, even at its prettiest and least black metal-like, is no chore to slog through. Even the standard black metal tropes, like a guitar tremolo, become uniquely their own. Go to about the seven-minute mark for a sweet, harmonized tremolo. It's hair-raisingly awesome. At this point, I find myself at a similar point as I did with the review of Believe. I want to make a PowerPoint slide of every heart-rending moment I found in these songs. You know how you never get to hear the bass in most black metal? Check out the drum-and-bass-only break in "Labyrinth Unfolding Echoes." Revel in the perfection of the instrumental "Warm Quiet Centuries of Rains." Even the song names help envelop you in this atmosphere. And if you're worried there's not enough fire, then stick around for the fever pitch that builds in the album closer, "Impermanence Streakt Through Marble." As with the last release, I can't say enough good things about this album. 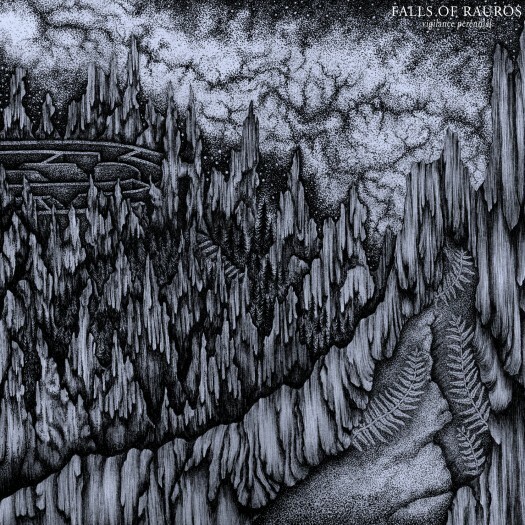 Sure, there are other bands who attempt to do what Falls of Rauros does, but for my money, they're a sparkling anomaly in the black metal scene, and I want to stay on this ride with them for as long as they're making music.